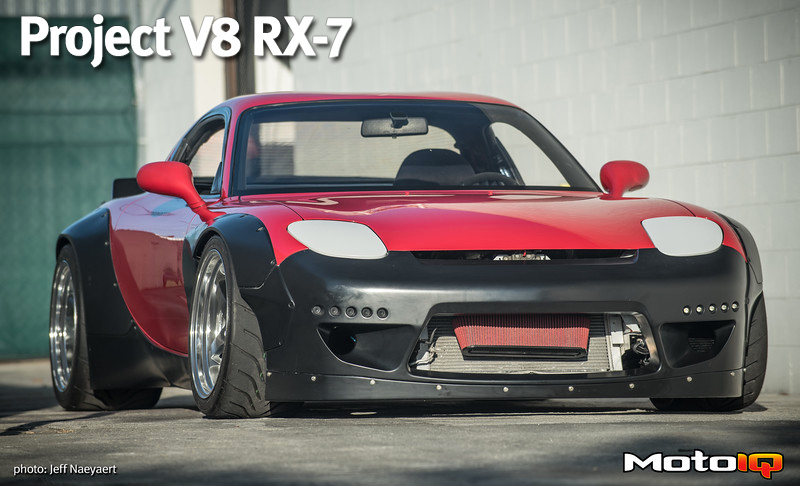 In our last Project V8 RX-7 article, we left you with photos of our new SSR Professor SP4 wheels and Toyo R888 tires looking flush but we weren’t ready to explain how we accomplished that look yet. 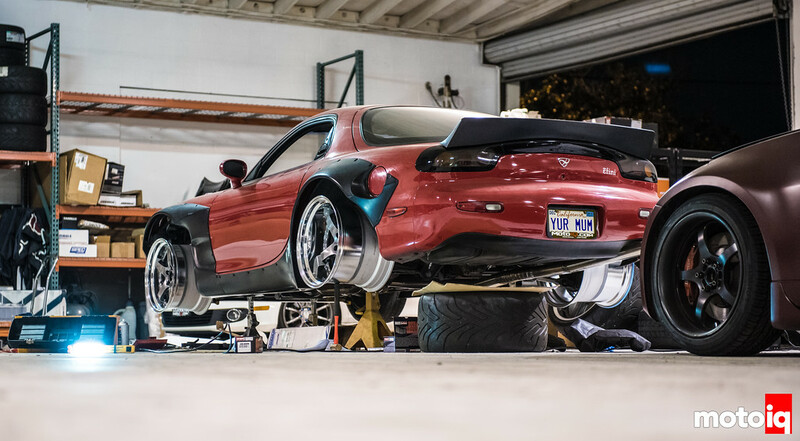 With our Rocket Bunny aero kit giving us a huge space in the wheel wells to fill, we have to take advantage of all of that. Typically, our show car brethren would do something like getting a 275 rear tire and 245-255 front tire, stretching them on 10-12″ wide wheels and using a lot of spacers to fill the extra wheel well space to make it all flush, but us being us, that option would not fly. Our car had to use all of the space for wide wall-to-wall rubber. More rubber means more grip, and with our LS3 providing the torque and power to use it all, we were obligated to do so. However, just putting wide rubber on a car not designed for it creates a few technical issues that, since we are MotoIQ guys, have to be engineered out of the equation. This means the typical spacer to fit and beat to match approach was not going to be a solution. 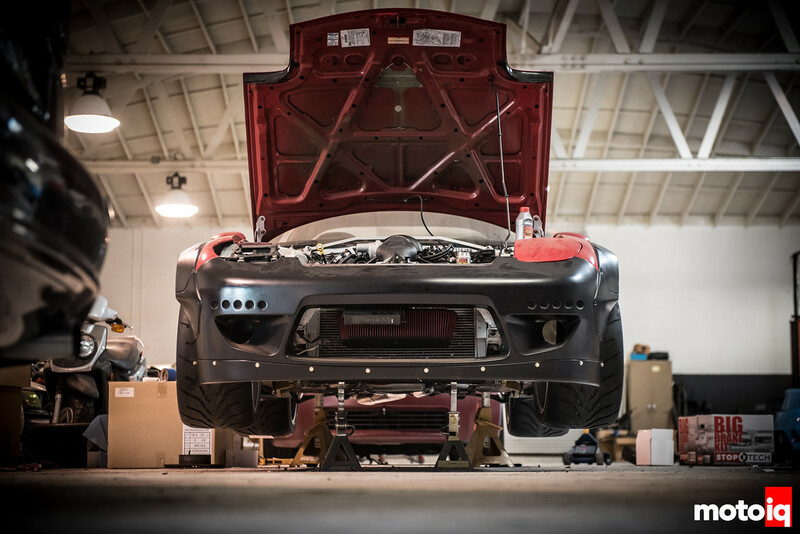 We spent a lot of time coming out with decent close to center offsets that would not stress out our wheel bearings too much by cantilevering the loads on them but still have plenty of badass looking lip. As you might recall, we got custom SSR SP4 wheels with an 18×11″ with a 37mm offset front wheel and an 18×13″ rear wheel with a -23mm offset. This huge combination would help us meet our goals with some help. For tires, we chose Toyo R888’s, a 295/30-18 for the front and a 335/30-18 for the rear. That is a ton of rubber for this small, lightweight car! Even with the wide wheels and huge rubber, we still had a lot of room between the tire and the front fender lips with our modest wheel bearing spacing offset. The tires also rubbed the frame rails at full lock. We stated that we didn’t want to make up the nearly 2-inch gap between our front wheels and fenders with spacers or a wheel with a drastically different offset, so the only other way to move the wheel outboard is by modifying the suspension components as some of you already guessed in the comments section of the last article. If we used a more negative offset or spacers to fill the gap as what is done typically, we would have run into some issues. The first is that offsetting the wheel would cause it to swing in a larger arc as the steering was cycled. This would use up fore and aft space in our wheelwell, cause the tires to hit pretty solid, and require modifying stuff like the chassis rail ends as the steering was cycled. Next, with a huge tire spaced outwards, the wide wheel would put a lot of cantilevered leverage on the hubs and wheel bearings. This would lead to rapid bearing wear and since we now had fixed caliper racing brakes, we would potentially have issues with brake pad knockback. This would give an inconsistent pedal on the track. With a large offset, the front tires would be pushed sideways as the steering wheel was turned. When this is done to a large extent as in this case–a super negative offset–the car can have odd turn in characteristics, tramline badly and have weird reactions when braking on split mu surfaces. The car would also heavily jack as the steering wheel is turned as the wideness levered outward exaggerates the effects of caster and king pin angle. This can really affect the corner weights and the balance of the car. Finally, we would like to get the front track as wide as possible. as this helps reduce understeer. The stock lower control arms were nice forged aluminum units, and at first, we had considered modifying them to be longer. However, considering that we were going to be close to 2″ outboard and that we wanted to have the abilty to fine tune the alignment, that was ruled out pretty quickly.